Candida Auris, An Infectious Fungus, Implicated In 7 U.S. Patients : Shots - Health News The fungus Candida auris has infected hospitalized patients with weakened immune systems or other serious conditions. Four of the seven patients died, but it's unclear if the fungus was the cause. 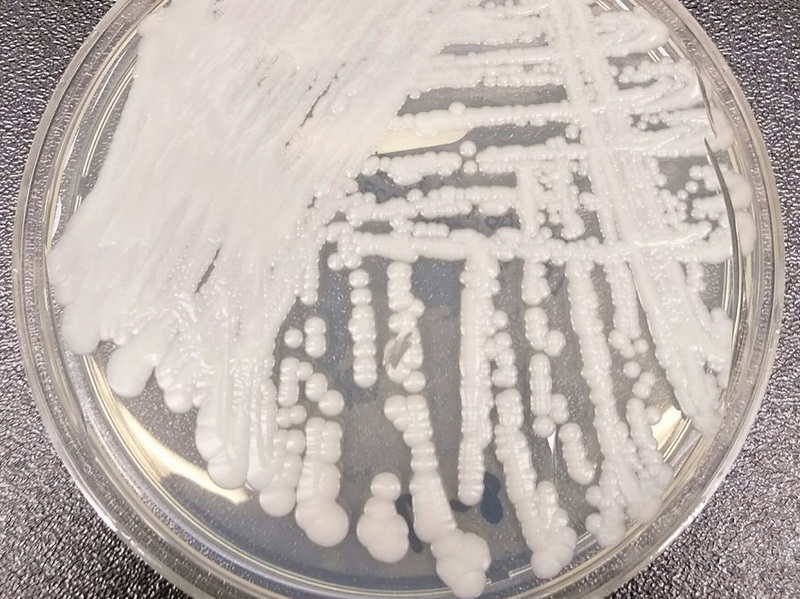 Candida auris is a fungus that can cause invasive infections, is associated with high mortality and is often resistant to multiple antifungal drugs, says the Centers for Disease Control and Prevention. Four patients died of the seven the CDC examined in detail. Because they were all quite ill to begin with, it's not clear that the fungus caused their deaths. "We need to act now to better understand, contain and stop the spread of this drug-resistant fungus," CDC Director Tom Frieden said in a statement. "This is an emerging threat, and we need to protect vulnerable patients and others." The CDC reported details of these seven cases Friday in an early release of the center's Morbidity and Mortality Weekly Report. One concern: It appears that in two instances, the fungus may have spread within hospitals. Two cases appeared in an unidentified Illinois hospital. Two cases were also identified in an unidentified New Jersey hospital. These aren't ironclad cases however. In both instances, the patients were on different wards within the same hospital. The fungus is also hard to identify, though you have to admit that the diagnostic methods sound pretty spiffy. Labs can use "matrix-assisted laser desorption/ionization time-of-flight" analysis, or, if that's not handy, they can sequence the D1-D2 region of the fungus' 28s ribosomal DNA. The CDC report notes that since the fungus was first identified in Japan seven years ago, it has been detected in Colombia, India, Israel, Kenya, Kuwait, Pakistan, South Africa, South Korea, Venezuela and the United Kingdom. Many samples of this fungus turn out to be resistant to multiple drugs, though the U.S. cases all responded to at least one antifungal agent. In June, the CDC asked hospital labs to be on the lookout for this emerging disease. Indeed, five of the seven known cases in the U.S. appeared in 2016. The CDC used its report to remind health care facilities to use well-established infection-control measures, including thorough daily cleaning of patient rooms with disinfectants active against fungi. Updated 3:21 p.m.: The post was updated to include six cases the CDC mentioned in a media release but didn't study in detail.